The ant works hard in the withering heat all summer long, building his house and laying up supplies for the winter. 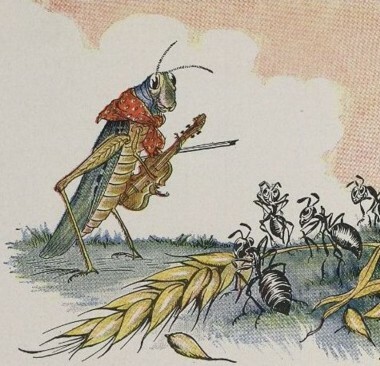 The grasshopper thinks the ant is a fool and laughs and dances and plays the summer away. Come winter, the shivering grasshopper calls a press conference and demands to know why the ant should be allowed to be warm and well fed while others are cold and starving. NDTV, BBC and CNN show up to provide pictures of the shivering grasshopper next to a video of the ant in his comfortable home with a table filled with food. The world is stunned by the sharp contrast. How can it be that the poor grasshopper is allowed to suffer so? Arundhati Roy stages a demonstration in front of the ant’s house. Medha Patkar goes on a fast along with other grasshoppers, demanding that grasshoppers be relocated to warmer climates during winter. Amnesty International and Kofi Annan criticize the Indian Government for not upholding the fundamental rights of the grasshopper. The internet is flooded with online petitions seeking support to the grasshopper. Opposition MPs disrupt the Parliament work and stage a walkout. Left parties call for a “Bharat Bandh” in West Bengal and Kerala demanding a judicial enquiry. The CPM(Communist Party of India) in Kerala immediately passes a law preventing ants from working hard in the heat so as to bring about equality of poverty among ants and grasshoppers. Lalu Prasad allocates one free coach to the grasshoppers on all Indian Railway trains, aptly named the Grasshopper Rath. Finally, the Judicial Committee drafts the Prevention of Terrorism against Grasshoppers Act (POTAGA), with effect from the beginning of the winter. Arjun Singh makes special reservation for grasshoppers in educational institutions and in government services. The ant is fined for failing to comply with POTAGA and, has nothing left to pay his retroactive taxes. His home is confiscated by the government, and handed over to the grasshopper in a ceremony covered by the NDTV. Arundhati Roy calls it a “triumph of Justice”. CPM calls it the “revolutionary resurgence of the downtrodden” . Kofi Annan invites the grasshopper to address the UN General Assembly. Many years later, the ant has migrated to the USA and being diligent and sincere, set up a multi-billion dollar company in the Silicon Valley. Hundreds of grasshoppers still die of starvation in India despite reservation. As a result of losing a lot of hard-working ants and feeding the lazy grasshoppers, India is still a developing country. From: The Telegraph, article by Khushwant Singh. ps: cant seem to trace where i got THIS version from, corrections welcome. I like your illustration of planet wide politics. It’s a pity that government has evolved to such extremes.